Anirudh Mishra was born and brought up in Varanasi. He did his schooling from Jasant Modern, Dehradun. After which he did his B Com from DAV, Dehradun. 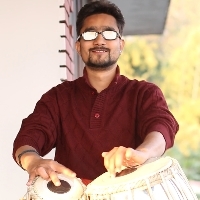 He is from a musical family and started playing Tabla at the age of 8. He started playing Tabla professionally in 2012. Tabla is an Indian classical instrument. Tabla is relatively similar to drum and it’s a most common accompanying instrument which you can play as solo, accompanying with dance, instruments and vocal. "Being from a music family, I started playing Tabla at the age of 8 and Professionally, I am playing Tabla since 2012."